LeConte Lodge® is pleased to offer an assortment of exclusive merchandise online. This store offers a variety of LeConte Lodge® apparel, gear, and giftware items not sold anywhere else, including a print by local artist Robert A. Tino. These pieces make great gifts for friends and family members that want to remember their hike to the Lodge, or for those who love the Great Smoky Mountains National Park. Our unique “I Hiked It” merchandise can only be purchased by hiking to the lodge gift shop, but a few date specific and non-date specific items will be sold both online and on the mountain. A percentage of all sales from this store go to support the Great Smoky Mountains National Park. Please allow 2-4 weeks for delivery of your order. Please check the site periodically as items may change throughout the year. Guests have been enjoying our Dining Hall inspired ceramic mug for years. Now lodge enthusiasts can purchase these NEW sturdy and stylish Campfire Mugs online! Available in three different colors with a speckled finish and a flared top. These 16 ounce ceramic mugs will be a great way to sip on your favorite coffee, hot chocolate, or tea, just like on the mountain! Campfire Mugs are microwavable and home dishwasher safe. Now you can take the fresh fragrances of Mt. 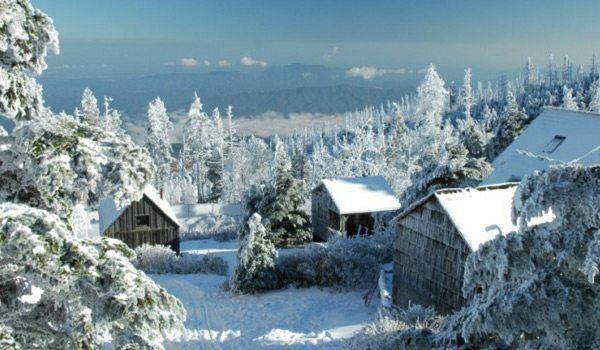 LeConte’s fir forests home with you! Measuring 3″ x 3” with forest green highlights, this logo-ed pillow will make the perfect keepsake. Produced entirely in Maine, these woodsy scented pillows carry the same distinct fir smells hikers have come to enjoy when visiting the lodge. Each pillow purchase includes an informative card discussing the benefits of aromatherapy! Love seeing our llamas? Now you can take one home with you! A great gift for all ages, this plush llama measures 8” tall and is machine washable. A wonderful way for your kids to remember their time on the mountain for years to come. For the person who is on the go or just needs to pack up all that loose hiking gear, this logo-ed Cinch Pack is a great way to show off your love for LeConte and the outdoors! Measuring 17”x20” and made with a durable color matching drawcord to endure the ruggedness of a day on the trail. Available in Navy, Forest, and Red. Columbia’s Men’s Glennaker Lake Rain Jacket is lightweight, no-frills rainwear that offers packable convenience and advanced Omni-Shield® repellency that beads moisture on contact. Zippered hand warmer pockets. Adjustable layback hood and elastic cuffs. Columbia’s Men’s Bahama II Long Sleeve Shirt is lightweight, durable 100% nylon that dries fast and features Omni-Shade UPF 30. There are mesh lined cape vents at the back shoulder and a button down collar. Two big chest pockets, PFG convertible sleeve tabs and PFG Venting. Columbia logo on left chest, PFG logo on vented back and LeConte logo on right chest. MountainTec Performance Apparel tee shirt made from 100% recycled polyester. Moisture wicking, quick drying with the LeConte logo on the chest. Grab this new LeConte Lodge T-Shirt available for the 2016 season! • Lightweight – 1.9 oz. • Now available in Forest Green and Navy Blue with LeConte Lodge logo. We’re returning to the trails of Mt. LeConte series, featuring the newly renovated Rainbow Falls Trail! This beautiful ornament highlights one of the tallest and most visited waterfalls in the Smokies, an inspiring sight to behold during your hike to the lodge! Add it to your LeConte Lodge tree ornament collection today. These ornaments are made locally by artist Tim Weberding in Gatlinburg, TN. ornament on your tree to commemorate your trip to LeConte Lodge! These ornaments are made Locally in Gatlinburg by artist Tim Weberding. ornament on your tree to commemorate your trip to LeConte Lodge! Second in the LeConte Trail series. These ornaments are made Locally in Gatlinburg by artist Tim Weberding. Get your own piece of history from The Smoky Mountains! Display your favorite LeConte photos in this unique picture frame, made from genuine Sevier County weathered barn wood. This frame holds 4” x 6” pictures. These frames are made Locally in Gatlinburg by artist Tim Weberding. These beautiful natural stone coasters each have a different image of the nostalgia that makes LeConte Lodge a favorite in the Great Smoky Mountains National Park! These 4”X4” solid stone tiles have a cork backing to resist sliding, and come in a mahogany finished holder. NEW COLORS and an improved design for 2019! Grab this water bottle as a perfect souvenir or gift from LeConte Lodge! This bottle is imprinted with the LeConte logo, and made from BPA free plastic. Not for hot liquids or carbonated beverages, the bottle is top dishwasher rack safe. just to have as a keepsake of your trip to LeConte Lodge! If you love our llamas as much as we do, then this decal is the perfect keepsake for you! This 4.5″x3″ tie-dye oval sticker featuring one of our famous pack llamas will look great on your car, water bottle, or even in a scrapbook commemorating your climb to Mt. LeConte. Made in the USA. just purchase to have as a keepsake of your trip to LeConte Lodge! This LeConte Lodge Cutting Board is a great addition to the kitchen, perfect for the cook in your home who enjoys hiking to the mountain. This logo-ed cutting board is made from maple right here in the USA, measuring 8″x12″ in size.Place this 2”x3” Wooden Magnet on your refrigerator, file cabinet, or just purchase to have as a keepsake of your trip to LeConte Lodge! Put this unique and useful LeConte Lodge Bottle Opener on display in your home, a great addition to the kitchen, basement, or garage. This logo-ed collection piece, made from oak right here in the USA, comes pre-drilled for easy installation. Purchase these hiking stick medallions to commemorate your trip to LeConte. Available for each of the main trails to the lodge, and for the lodge itself. LeConte Lodge® is proud to offer the only authorized painting of the lodge by famed artist Robert A. Tino. Robert brings the beauty of the Lodge and surroundings to life in “The Lodge at Mt. LeConte.” A limited edition of only 195 Giclees on canvas will be produced. A portion of every sale is being donated to the Friends of the Smokies to benefit the Great Smoky Mountains National Park in honor of their 75th Anniversary. There are three sizes available, 22″x10″, 36″x16″, and 48″x22″. The prints are shipped unframed in a protective tube. Please visit the Robert A. Tino website to obtain information on frames for the prints. Shipping/handling charges and tax are included in the price of the print. Print orders are shipped by either USPS Priority Mail or UPS ground. Please allow 7-10 business days for processing of your Robert Tino print order.